Fifty years ago today (May 25), President John F. Kennedy presented NASA and the nation with a historic challenge: To put a man on the moon and return him safely to Earth before the end of the 1960s. Kennedy's dramatic 1961 speech jump-started NASA's Apollo program, a full-bore race to the moon that succeeded when Neil Armstrong's boot clomped down into the lunar dirt on July 20, 1969. The moon landing was a tremendous achievement for humanity and a huge boost to American technological pride, which had been seriously wounded by several recent space race defeats to the Soviet Union. "This is the most significant decision made by our national political leaders in relation to space activities," said Roger Launius, space history curator at the Smithsonian's National Air and Space Museum. In addition to starting up humanity's first journey to another world, he added, "it transformed NASA into a big space-spectacular agency, which it wasn't before." Then, on April 17, 1961, the disastrous Bay of Pigs invasion began. A small group of CIA-trained Cuban exiles stormed the island nation in an attempt to overthrow the communist government of Fidel Castro, which was backed by the Soviet Union. The would-be revolutionaries were defeated within three days. And the Soviets had notched another huge victory less than four years earlier with the surprise launch of Sputnik I, the world's first artificial satellite, in October 1957. That momentous event effectively started the space race. "The Soviet Union kind of had defined the playing field as space success, and Kennedy came to the conclusion that he had no choice but to accept that game rather than try to shift the stakes into something else," said space policy expert John Logsdon, author of "John F. Kennedy and the Race to the Moon" (Palgrave Macmillian, 2010). The consensus answer: A manned moon landing. "They [the Soviets] would have to build a new, larger rocket to send people to the surface of the moon," Logsdon told SPACE.com "And so the moon became the first thing where the United States had, as [famed rocket designer Wernher] von Braun said, a sporting chance to be first." Kennedy presented the ambitious moon goal just six weeks after Gagarin's flight. The year Kennedy and his advisers originally had in mind for the first manned lunar landing makes clear that Cold War concerns motivated the president. "The initial speech says 1967," Launius told SPACE.com. "The reason for that was, that would be the 50th anniversary of the Bolshevik Revolution." But Kennedy apparently had second thoughts about that timeframe, worrying that landing a man on the moon in less than seven years might prove too difficult. So he did a little last-second improvising. "Literally on the way up to give the speech, Kennedy just strikes through that and says, 'by the end of the decade,'" Launius said. 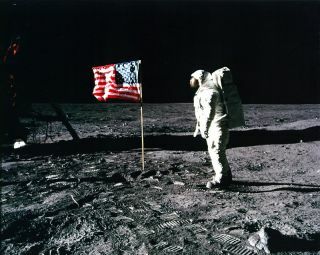 The Apollo program achieved Kennedy's goal on July 20, 1969, when astronauts Neil Armstrong and Buzz Aldrin became the first humans ever to set foot on a world beyond Earth. Five more Apollo missions eventually landed astronauts on the moon, the last one coming in December 1972. The impact of Kennedy's words, however, did not end with that last mission. His speech changed NASA in fundamental, long-lasting ways. "To make the moon landing possible, NASA had to be ramped up a lot in terms of funding," Launius said. "It had to have new centers built, and new systems put into place to accomplish this task. So one of the things that was a result of that was the creation of an infrastructure that now has had to be fed ever after." While NASA's budget has been scaled back considerably from its Apollo heyday, the agency has had to keep supporting those centers and their large numbers of personnel. NASA has not been allowed to trim infrastructure in an effort to stretch its limited funding, Launius said, because that would mean job losses in the districts of influential Congressmen. "I know there have been attempts by NASA administrators over the years to try to close down centers, and they've been stopped at every turn," Launius said. "So you're spending more money today than you would like to spend just on the stuff associated with facilities." NASA had a plan for human spaceflight before Kennedy's speech. It involved demonstrating a proficiency in low-Earth orbit with the Mercury program. Later, the agency would develop a winged, reusable vehicle, like today's space shuttle, and put a space station into orbit. Then would come more ambitious journeys — going to the moon and, eventually, to Mars. "That was a fairly reasonable, integrated strategy," Launius said. "When Kennedy said, 'Let's go to the moon,' he threw all of that into a cocked hat." So maybe NASA astronauts would have made it to the moon someday anyway, perhaps a few decades later, and Kennedy's stirring speech just shook up the timeline. But that's not a given, considering how often expensive, ambitious spaceflight plans fail to be realized (the cost of the Apollo program is estimated at $25 billion, well over $100 billion in today's dollars). So perhaps Kennedy's bold challenge, driven by the pressures of the Cold War space race, was essential. Maybe without that speech, humanity would still be looking up at the moon and wondering when the first human foot would ever settle into the gray lunar dust. Kennedy's speech "was a product of the convergence of the politics of the moment with the dreams of centuries," Logsdon said. "And I think Kennedy was a leader who was able to do that, to mix long-term vision with political reality in ways that turned into something grand."